Well, I didn’t break any bad habits while in Paris (unless becoming accustomed to a daily aperitif at 5 o’clock counts? ), but it did get me thinking about what mine are back home and how I might one day break them. But if one packed box leads to another and Matt ends up being right, I’m happy for this kitchen to go out on such a great meal. 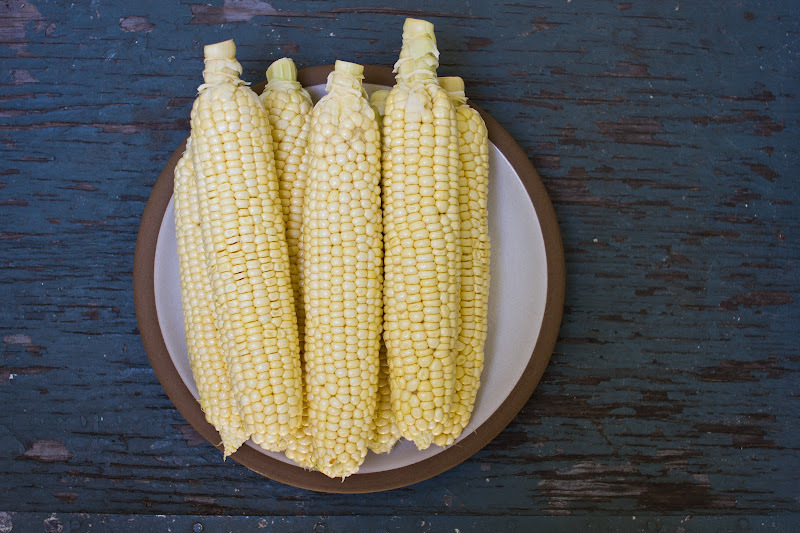 I had been trying really hard, for months now, not to buy the cookbook Plenty, (one more thing to own and box up) but with the arrival of summer and that bin of fresh corn greeting me outside the grocery-store entrance, I gave in in order to make this dish. Ottolenghi is right. 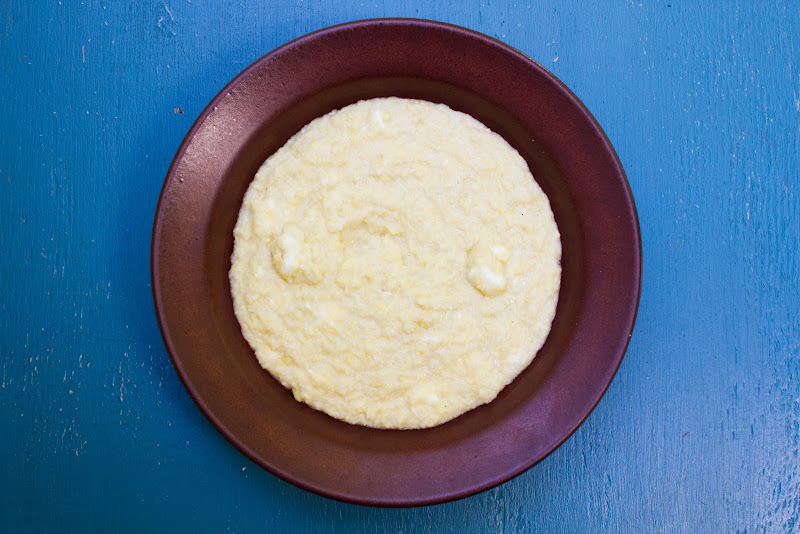 Don’t expect this sweet corn polenta to taste like regular polenta. No, it’s so much more like a rich, sweet corn purée with flecks of feta throughout. The dish on a whole is a bit labor intensive but definitely worth the effort, especially for a summer dinner party. In fact, I was just as impressed with the flavorful eggplant sauce as I was the faux polenta. Matt and I are moving from a one-bedroom, one-bathroom apartment we’ve shared these past four years to a three-bedroom, two-bathroom house with a yard and a driveway. And for this month of escrow, of being in-between homeownership and renting—I’ve been excited, though not just about all the extra space, the blessed space (! ), and the idea of getting a dog (Matt has already purchased this book. ), but also with the idea that in the new environment all of my cues are going to change. And you know what Duhigg says: when your cues change, your habits change. Perhaps I’m being overly optimistic, but I have plans for new cues that will lead to new habits, like, say, drinking my morning coffee outside on the deck, with the fresh air and sunshine instead of inside by the warm light of my computer screen; becoming a gardener and consequently having bunches of flat leaf parsley at my disposal; becoming someone who would have composted the ears of corn used in this recipe instead of throwing them in the trash; and of course, hosting family and friends for long visits and forcing them to shoot Bon Appétempt videos with us. If you haven’t had the opportunity to flip through the pages of this gorgeous book, I urge you to do so on your next trip to your local, likely understaffed bookstore. You’ll be shocked at everything this guy does sans meat. Actually, I think you’ll be inspired. I certainly have been. This may be the last you’ll see of our rental kitchen, but you’ll see plenty more of Plenty. 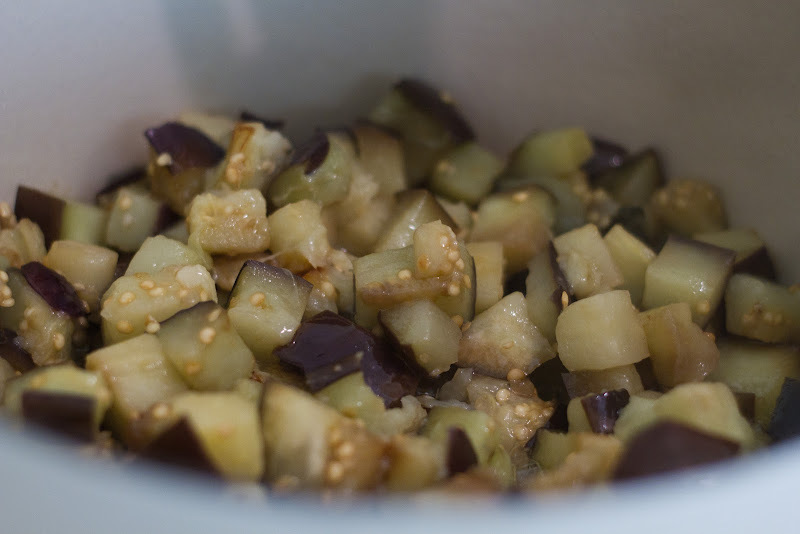 To make the eggplant sauce: Heat up the oil in a large saucepan and fry the eggplant on medium heat for about 15 minutes, or until nicely brown. (Note: the eggplant sticks to the pan like crazy towards the end of the 15 minutes, but don't worry, it'll come right off when you add the tomatoes.) Drain off as much oil as you can and discard it. 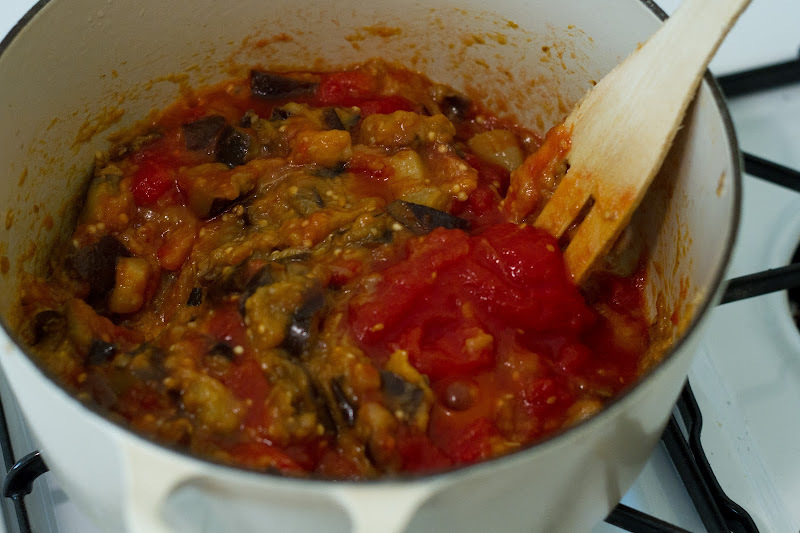 Add the tomato paste to the pan and stir with the eggplant. Cook for 2 minutes, then add the wine and cook for 1 minute. Add the chopped tomatoes, water, salt, sugar and oregano and cook for a further 5 minutes to get a deep-flavored sauce. Set aside; warm it up when needed. 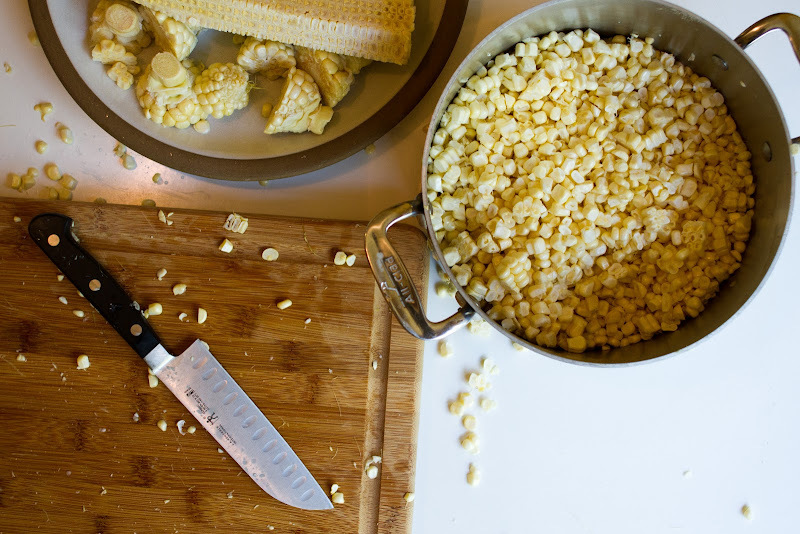 Place the kernels in a medium saucepan and cover them with the water. Cook for 12 minutes on a low simmer. 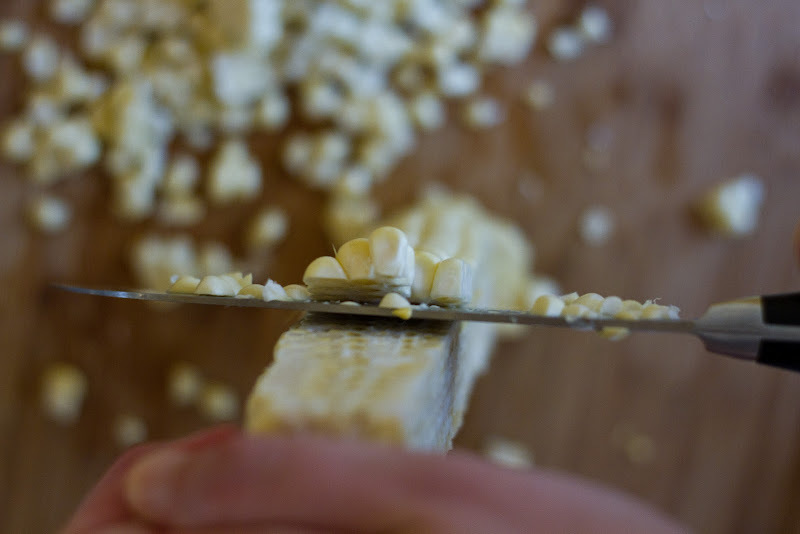 Use a slotted spoon to lift the kernels from the water and into a food processor; reserve the cooking liquid. Process them for quite a few minutes, to break as much of the kernel case as possible. Add some of the cooking liquid if the mixture becomes too dry to process. 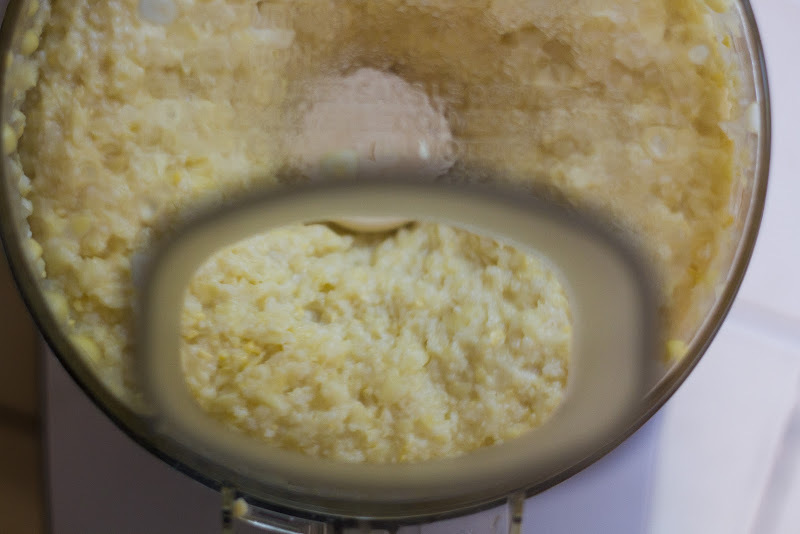 Now return the corn paste to the pan with the cooking liquid and cook, while stirring, on low heat for 10 to 15 minutes, or until the mixture thickens to a mashed potato consistency. Fold in the butter, the feta, salt and some pepper and cook for a further 2 minutes. Taste and add more salt if needed. 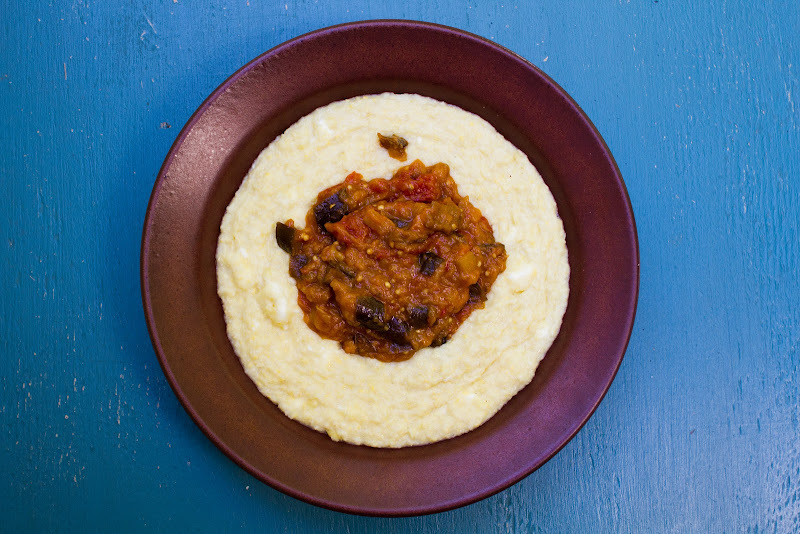 Divide the polenta among shallow bowls and spoon some warm eggplant sauce in the center. This was soooo good! It won't be the last post from the old kitchen though b/c we have two attempts stock-piled! Right? I'm with you on the love for this book. I loved this dish too, my other favourite is the parsnip dumplings in prune broth. Have you tried that one yet? The prunes give the broth the most amazing flavour! Good luck with the move! wowwwww you're really pushing that pesto you made, aren't ya?? I'm drooling! Cannot wait to see the new digs. Here's to breaking old habits! This looks SO good. Can't wait to hear about your new home -- if you need any gardening help, let me know! Ooh, I have been looking at Plenty and your post might just push me over the edge . . .
Congrats on the new house! Enjoy the space, and, especially, the kitchen space -- I hope it's bright and lovely with lots of storage and counter space for you to create lots more edible masterpieces. Hope the move goes smoothly! Amelia and Matt, congrats on the house. That's so huge! What are you going to eat, your first night there? Pizza and beer, while sitting on cardboard boxes? I moved from a tiny, not-studio-but-not-really-a-one-bedroom-either apartment in Manhattan to a three-bedroom house in Alabama last year. We have a porch, with a swing, and a back yard, and we were able to get a dog. We're still renting, but it's the space that's so glorious. The space, the space! I still get giddy about it sometimes. Yesterday evening I sat on the porch with a huge box of green beans from the CSA--almost a peck of them, which I've never seen before. And I snapped off the ends. It was magical--the sun was going down, and the routine motion of snapping over and over again let me free-associate the way I do when I go to the symphony. It was a kind of contentment I never felt in my place in New York. All that's to say that I am really happy for you and I'm excited to see this new kitchen! Cheers to both of you. This looks so, so good, and it might be just the thing to finally take Plenty out of my Amazon wishlist and into checkout. I always love reading your posts (have I said that before) for your unforced bits of insight and wisdom. The idea of habit cues resonates with me, especially now, as I burrow down to study for the bar exam. There are times when habit and routine can really help you be efficient, but I am missing out on things (like sitting outdoors, as you say). oh my goodness, Katherine, I just got the most amazing image in my head and now want to move to Alabama, or at least come visit. Sound cool? thank you and yes! I already know that I need loads of help! loads! We have a nice long strip of "garden" area at the side of the yard (photos to come?) and I'm already wondering if I need to build raised beds or if I can just get some good soil and lay in top of what's already there... From what I know (not much), in order for things to grow, you need good soil and sunlight. yes? Thanks, Louisa! And I have my eye on that one. Will try as soon as possible! this is one of my favorite cookbooks! the recipes never disappoint. 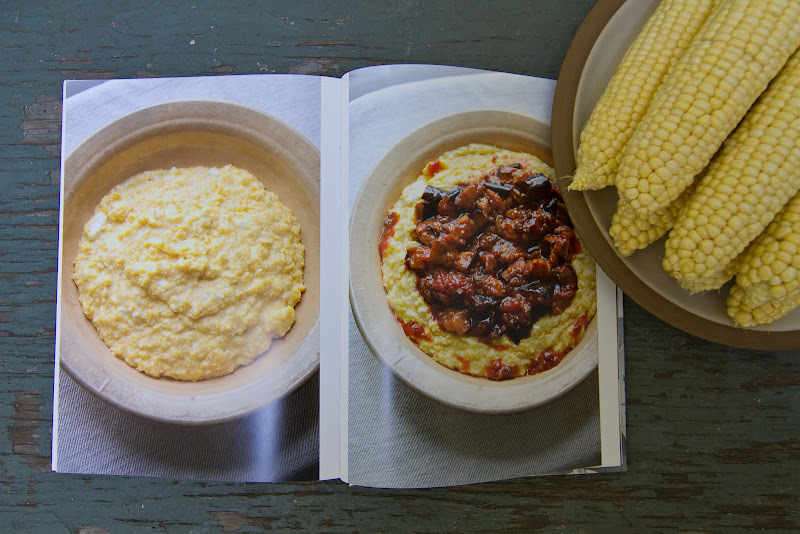 i haven't made the corn polenta, but sweet corn with flecks of feta sounds like a taste bud explosion that i am totally up for! as far as habits, i actually like most of mine. except that shopping one. i mean, i love it, but it's probably not the best habit to have?? This looks delicious. You've sold me on getting PLENTY - I've been waiting it out for some weird reason too. And congratulations on your new home! I'm very excited for you. You made me buy Plenty just now! Congrats on the house! Also, love love love Plenty! So glad you gave in. His black pepper tofu is spectacular. Can't wait to see what else you try. And if it turns out you have a green thumb at your new spacious home, please let us know! I can't wait to stay at your new house and be forced to make Bon Appetempt videos with you!!! It's my life's dream. The key ingredient to most good gardens is luck. For veggies, raised beds all the way... they look better and support the plants better. I think we all agree that we want to see pics as soon as possible! It's my life dream too! WOw, this meal looks delicious! 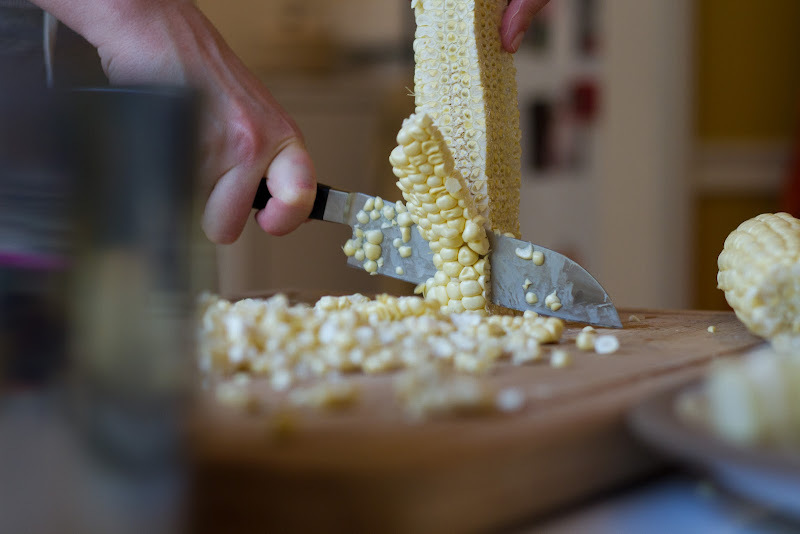 Polenta from fresh corn?? That's awesome. Happy moving and housing transition; it is so fantastic to move to a place with an "outside"! Funny you spoke of vacation here, this is exactly the kind of thing I can imagine making during vacation, during siesta time, and eating with friends in the eve. I love how a "life is beautiful" vibe sings through this post ~ good food, good friends, and the promise of a garden, these are the priorities I think that more and more of us share. May all your habit breaking wishes come true at your new home! I look forward to stories about your new adventures! I'm embarrassed to say I've owned "Plenty" since Thanksgiving and although I've drooled over the pages so many times, I've never actually cooked anything from it yet. I'll change to change that right away! Oh--forgot to mention that that Fresh Air interview sounds so interesting! I've gotta find it. *fascinating* about how to change habits! i'm with you... i ought to enjoy my morning coffee outside on my deck, properly greeting the new day... instead of, gracious... whatever it is i do. must keep this in mind. also! love this post as i can make the recipe verbatim! i've turned 95% vegan since moving back to the states (more my palate & skin's decision than mine) and some sheep's feta from france is on my "approved" list! hurray for ottolenghi & other like-minded UK chefs. 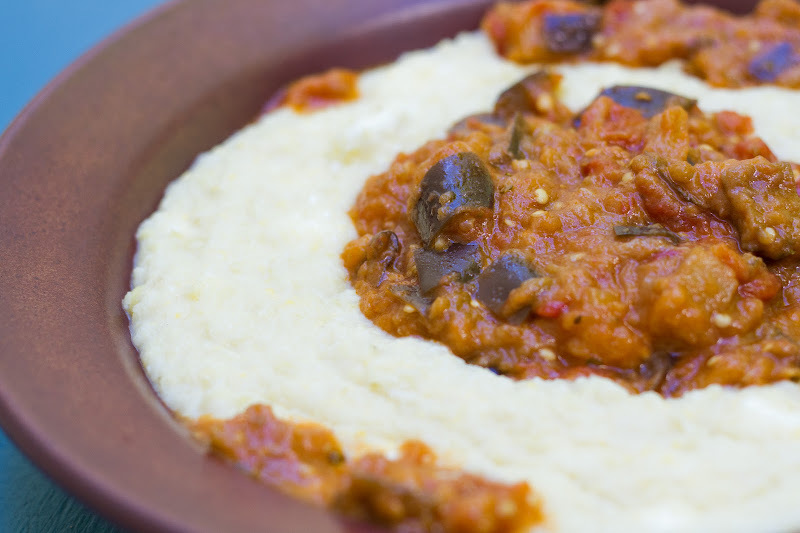 I made the eggplant sauce over the weekend and served it over regular polenta and it was awesome! It was so easy to make and has a lot of flavor. I'm also getting lots of eggplants in my CSA box and I had no idea what to do with them, so this recipe was very welcome.